I would rather …………………………. over Cappadocia. I think caving was ………………………. . I didn’t like it. Riding an elephant is …………….. dangerous ……………... climbing a mountain. I would rather ………………. a motorcycle tour on a mountainous road because it’s so adventurous. I prefer seeing the Pyramids because ……………………………… . Yukarıdaki görsele uygun düşen cümleyi işaretleyiniz. A) I would rather ride a bike than a motorbike. B) I prefer riding a motorbike to riding a bike. 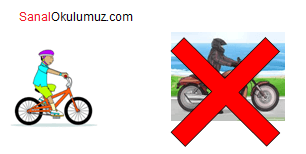 C) I would rather ride a motorbike than a bike. D) I think riding a motobike is better than riding a bike. I’m an adrenalin seeker. I love doing ………………………. I love sea a lot. I would rather try ……………………. My best friend ………………… mountain biking ………………... ice climbing. Maria: I would like to try kayaking on my summer holidays. Which equipment does Maria need?